The waters of the Futaleufú river are some of the most dangerous of the world: white, furious and turbulent. 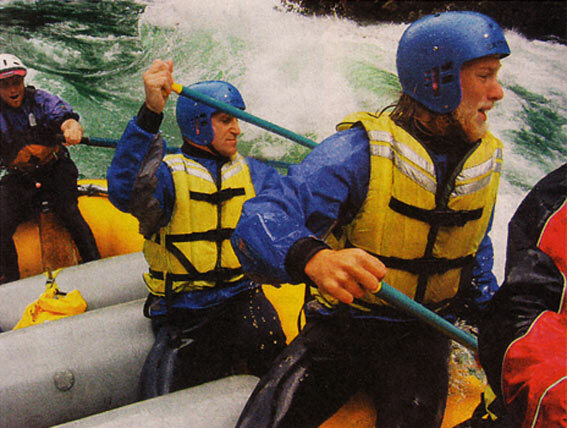 Rated “class V” in difficulty by whitewater rafting aficionados the waters of the Futaleufu can be lethal. For this reason the river has gained world-wide fame. Some gringos even call the village of Futaleufú the the capital of Chile, although it is only a border town, of few inhabitants, who have little to do with adrenalin and dollars. In Futaleufú there is no ATM, petrol station, nor a reliable internet connection that really works. The town resembles that of an old postcard, with gauchos on mounted horseback, women who do not use their own names but those of their husbands, and children who at twelve years must emigrate from the village to finish school. Futaleufú is on the border of Chile, exactly ten kilometers from Argentina (far from the nearest Chilean town of Chaiten) - and also on an ambiguous border of modernity. If not for the outside world, because the Futaleufú river attracts foreigners from across the globe, who come and go with loaded light trucks piled high with rafts and oars, perhaps Futaleufú would be no more than a pretty sounding name (in Mapuche it means "great river"). Like one of the so many places in Chile that are invariably isolated during the winter months, with depleted store shelves that are cut off from the fresh vegetables and produce that arrive from the city every week. Chris Spelius emphasized the turquoise color of the "Futa" when he speaks of it, as do so many others. It is a brilliant color that at short distances reflects the surrounding forests and extraordinary force bound within its waters. The river is born in an Argentine lake and on the Chilean side it runs completely free and wild. In certain high sections there are calm backwaters, where fly-fishers ply the waters, but from the border it is almost non-stop rapids which is why the natives of Futaleufu always keep to a safe distance. Chris arrived in 1985 and "discovered" this class V river: a difficulty scale with several classifications in the rafting and kayak world, between one and six of what is humanly possible to paddle (although six does not count, because it is impossible to run). The class V Futa is a large volume river that at certain points demands very precise paddling techniques. We heard of waves of up to three meters high, enormous, randomly placed protruding rocks, powerful downward heading currents that come up along the riverside - everything simultaneous. In brief, degree five whitewater is like entering a giant washing machine, without having a way to leave. The Futaleufu draws about three thousand tourists every summer. Many of them foreigners who don’t stop in Santiago. Israeli travelers are the first to arrive in December, whereas in January and February appear the Chileans who travel the Southern Highway and the many gringos who call the Futaleufu the “Shangri-La” of the rivers. In fact, one of the North American guides who works on the river in the summer, thought the village of Futaleufú was the Chilean capital! For those who seek out the greatest rivers in the world to kayak and raft, the Futaleufu is in the same category as rivers like the Colorado in the United States, the Zambezi of Zimbabwe, the Tsang Po of China, and the Franklin of Australia. Especially after the Bio Bío river disappeared for sportsmen with the construction of the Ralco hydropower station. 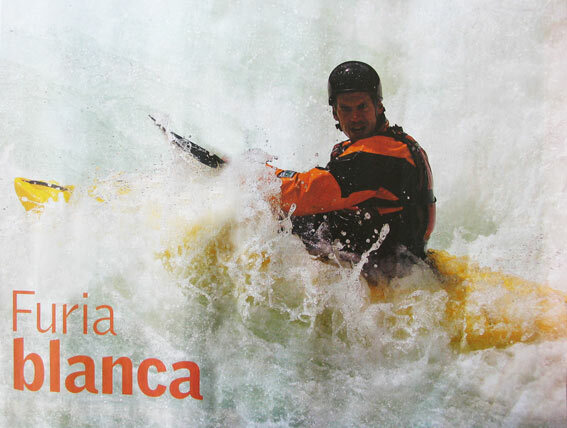 In the year 2000 the world rafting championships were held here on the Futaleufu river. Because of its tremendous worldwide popularity most of the money coming in is paid in dollars. However, many the "tourist packages" are not for Chileans, unless some well-off citizen can pay $2500 for one week of river running between the mountain ranges and the sea.This morning is cloudy with little sun, but a group of tourists rafting with Expediciones Chile are prepared. They will descend the "bridge to bridge" section which contains nine named rapids: eight of degree four and one of degree five, with descriptive names like "Pillow", "Shark" and "Meringue". One tourist is a German, a lover of the Chilean south, four Americans of college years who are finishing an eco-challenge course near Coihaique, in addition to a doctor of marine biology Javier Egaña and his son Daniel. Working as guides today are Jim Coffey, captain of the Canadian national rafting team, who is not only a kayaker with world wide experience, but in addition is a "professional swiftwater rescue instructor". Jim Coffee will go in a kayak along with Andrew Slater, another Canadian, who resembles the biblical Sampson. Scott Brady will be directly in charge of the raft containing the tourists and Rodolfo Road, a Chilean of 23 years who learned whitewater rafting in Vancouver. Rodolfo will pilot a cataraft, a type of large raft with pontoons and oars that serves as the last line of defense in case of the need for rescue. Altogether, four guides for seven tourists. “What are probabilities of swimming?” - the doctor asks, when he sees all of the security precautions. The doctor knows that, although the equipment is of latest generation and the professional training of the guides, there is always the possibility of falling out of the raft (nobody can be tied into the raft, because that would make difficult the rescue in case of capsize). Somehow, the ghost of the woman who died here on the second week of December is on the minds of all. She was English and traveling with her husband and was ejected from the raft. Her guides claimed she was terminally ill and had only three months to live. Those that rescued her deformed body say that his husband was glad she passed away rafting on the Futa. They also say that the guides of the company contracted by the English tourists (Futaleufu Explore) had not done a single training run this season and were not familiar with the "bombproof safety line” – the safest path to descend the river. One assumes that such ignorance caused that the woman to be ejected in a rock garden that entrapped her foot and would not allow her to swim free. The current thundered against the body. In contrast, this morning’s descent has been two weeks in the planning with training that included: "reading" the river and numerous descents without tourists to learn where and how to find the safest routes. Chris supervises them. And this tourist group is the first one of a rafting season that begins in December and finishes toward the end of March. “What is the bombproof safety line in "Maso Menos?” - Jim asked Chris the first time he saw one of the most famous rapids on the Futa. A rapid that is almost one city block in length and where the kayakers disappear under the waves only to reappear many meters down the river. “I have been running this river for twenty years and I still do not know it” – Chris responds, before letting out a burst of laughter that infects everybody. They are all amused. The daily challenge, the adrenalin which is released with each descent, works like a powerful magnet for this group of sportsmen. Nobody is in favor here of banning river running, although in the last eleven years six people have died, both tourists and guides. A person, once in the water, depends somewhat on chance for survival. Currently, most of the visitors who arrive in the summer prefer calmer outdoor activities. Raquel Almonacid, the owner of the Continental Hotel, remembers the first sport fishermen to arrive in town. Sixty years ago the first colonists arrived in the valley, many of them Argentine. They traveled by horse or in "car", as they like to call their carts. Those were the years in which economic opportunity beckoned people from the border to the town. A time in which the cypresses trees adorned the environs even more than they do today. What can be said of the other comforts city dwellers expect? Electric lights and the telephones with operators arrived in the 1990s. On the positive side there is not much to spend money on, so it is possible to save and there are few places to go in a car. When Chris arrived in the area, after making a decent of the Bio Bío river, the houses of in Futaluefú did not even have hot water. Today, this gringo of Idaho can take long hot baths, on the hill where he constructed his "Condornest", a wood house that rents with room service included. But today we are rafting. This morning the doctor wants to know what the probabilities are of coming out of the raft. And the answer is a predictable: “great”. The river is high and the contracted bridge-to-bridge section includes the "Mundaca", a frightful class five rapid that finishes just where an enormous stone begins. The "bombproof safety line" is through a chute with a slope of thirty degrees. In the "Mundaca" the river loses its green color to become completely white. The currents are chaotic. How does one distinguish the correct route through the rapid? What do you tell the tourists who are running this rapid? In this section, the Futa is deafening. Andrew goes first in his yellow kayak. For a moment he disappears under the waves, but is able to advance without problems. Jim follows, and with a precise movement of the paddle evades the tremendous rock that divides the river in two. Now it is the turn of the tourists. The Cataraft of Rodolfo watches them close by and, in a matter of seconds, the seven are in the center of the rapid. From the riverside, the oars seem like the hysterical flutter of a great bird – despite the effort the raft balances precariously horizontally and vertically. Suddenly someone comes out. Or almost. Just when it seems one of the American young people is going to fall in the water, a companion pulls him back forcibly by the shoulders and back in to the raft. The "Mundaca", and the fears of the doctor, are definitely gone. - Incredible! Incredible! Until I breathed water! - comments Daniel Egaña when finishing, with an enormous smile of satisfaction (and lightening) in the face. The other tourists shake the water, while they interchange glances that come with surmounting challenge. The guides, meanwhile, proceed with military efficiency to gather rafts, to right kayaks, to reunite oars with people and to plan the descent of the next rapid. Today’s run was the first of the season and all the guides know that any run can be the last one. For that reason, in spite of the cold, nobody breaks smile.